newenglandcowgirl | Cooking, Crafting, Sewing, Gardening, Drawing, Writing, Fishing, etc. 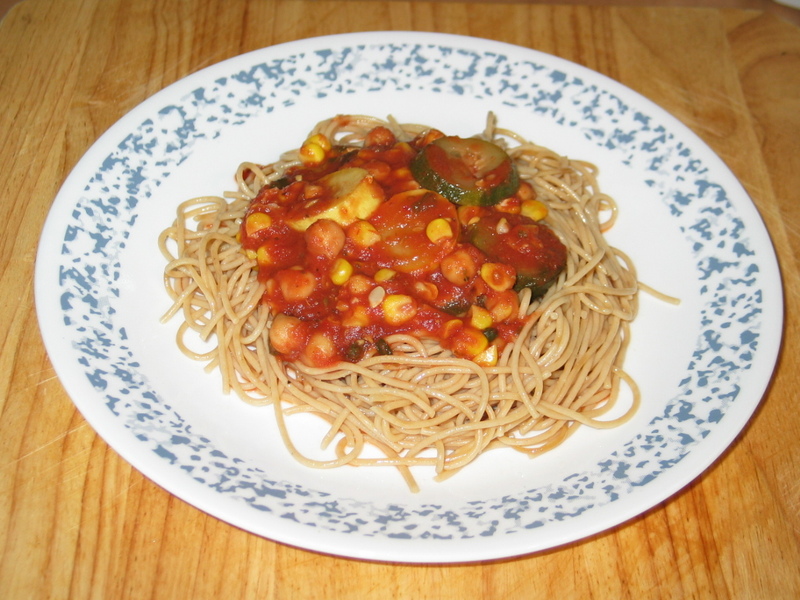 This was dinner tonight….Whole wheat pasta with a tomato and chickpea sauce, with zuchinni; yellow squash; corn; and also added some fresh garlic; thyme; organo; and basil. I thought it was pretty good…I think it could have been better. Mike ate it but I don’t think he really liked it that much. I thought it was okay for a meatless alternative…But I need to work on this recipe. When I perfect this recipe and it’s awesome I will share it. I really went a little crazy with the tomatoes this year. I started over one hundred plants from seed I had saved from last years crop in the hopes of maybe sellling some of the plants and making a little extra. Well I started the seeds way to late so everyone around me bought their plants at the local walmart etc. I now have over 53 plants planted throughout my garden, my second garden and everywhere else I could find a space. Well what am I going to do with that many tomatoes… make everything that I can that calls for them haha. Anyway in browsing for recipes that will use tomatoes I came across this one at Canning Homemade, and it sounds delicious, has great reviews, and looks pretty too. I am sure it will be wonderful and when I make it I will write a follow up on how it turned out. Preheat the oven to 400 degrees peel away the dry outer layer of the garlic bulbs. Cut top off and leave bulbs intact. Place cut side up on a casserole dish and drizzle with one tablespoon of oil. Cover casserole and arrange peppers cut side down on a foil lined baking sheet. Brush with remaining 2 tablespoons of oil. Roast garlic and peppers for 40 -50 minutes or until the pepper skins are charred or the garlic cloves are soft. Cool garlic on a wire rack until cool enough to handle. Pull up foil to enclose the peppers. Let peppers stand for 15 to 20 minutes or cool enough to handle. Peel off skin and discard. Set aside peppers. Remove garlic by squeezing the bottom of the bulbs. Place garlic cloves in a food processor and add cut peeled tomatoes into chunks. Add some of the chunks to the garlic in the food processor. Cover and process till chopped. 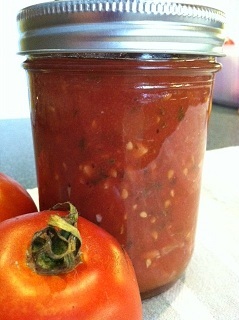 Transfer chopped garlic and tomatoes to a 7-8 quart stainless steel heavy pot. Repeat chopping the remaining tomatoes in batches in the food processor. Add all the tomatoes to the pot. Add brown sugar, salt, vinegar, and black pepper to the tomato mixture. Bring to low boil and boil steady for 50 minutes stirring often. Add chopped roasted peppers to tomato mixture. Low boil for 10 to 20 minutes more or until mixture reduced to 11 cups and reaches desired consistency stirring occasionally. Remove from heat stir in basil and assorted herbs. Spoon 1 tablespoon of bottled lemon juice into each of the hot sterilized pint jars. Ladle hot sauce into jars with lemon juice leaving a ½” headspace. Wipe jar rims, adjust lids. Process jars for 35 minutes in a water bath at a full boil. Makes 6 pints. I just wanted to share with you my daughters FB page..I am so proud of her, she is full of inspiration and information. If you like being healthy, or are planning to get that way soon please visit her page and get a dose of healthy. 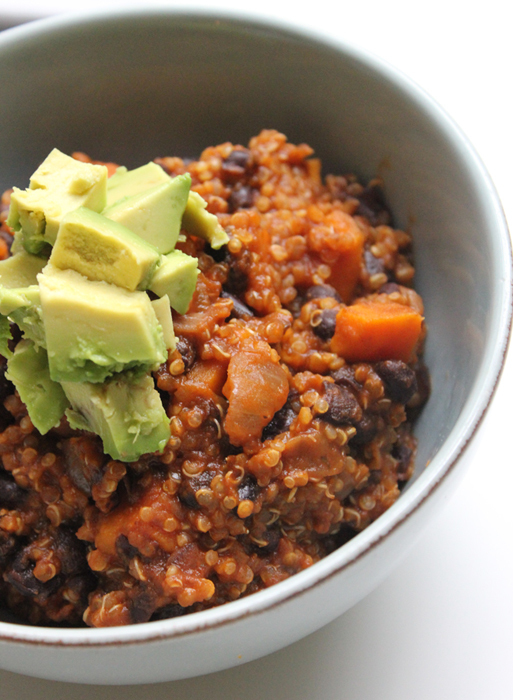 Milk Free Mom » Vegan Quinoa & Sweet Potato Chili. Oh wow!! This recipe sounds so good and the picture makes my mouth water. I love Chili and this one is definately going into my fav recipes. This will be great this winter. Thank You Milk Free Mom for this wonderful image and recipe. Heat the oil in a large heavy soup pot over medium low heat. Add onions, and cook until soft and they start to turn brown (about 10 minutes). Add the garlic, and cook for about 2 minutes. Add the tomato paste, chili powder, cumin, and oregano and cook for about 2 minutes, stirring constantly. Add the beans, stock, and potatoes, and season with salt and pepper . Cook for about 5 minutes, then add the quinoa. Continue cooking for about 15 minutes, stirring frequently, until quinoa and potatoes are cooked and the chili has thickened. Add a bit of water if the chili becomes too thick for your liking. Top with avocado and chopped cilantro. Scrumptious! I love this Blog… This recipe sounds so good, and I have been looking for a fast sweet pickle. Thank You Hannah so very much for this recipe. I am going to add this to my fav recipes. Directions Wash and dry the cucumbers. Using a sharp knife or a mandolin, slice the cucumbers thinly and place in a colander. Sprinkle with the salt and toss to coat. Place the colander over a bowl and allow it to sit, covered, for about 1 hour. Rinse off the salt and dry the cucumber slices well. Place them into a sterilized quart jar, along with the onion. In a small saucepan add the remaining ingredients. Stir to dissolve sugar and bring to a boil. Remove from heat and allow it to cool. Pour the brine over the cucumbers in jar. Cover and refrigerate at least 4 hours, preferably overnight. Will keep, refrigerated, for about 2 weeks. Properly handled sterilized equipment will keep canned foods in good condition for years. Sterilizing jars is the first step of preserving foods. Sterilizing Tips: Jars should be made from glass and free of any chips or cracks. Preserving or canning jars are topped with a glass, plastic or metal lid, which has a rubber seal. Two piece lids are best for canning, as they vacuum seal when processed. Before filling with jams, pickles or preserves, wash jars and lids with hot, soapy water. Rinse well and arrange jars and lids open sides up, without touching, on a tray. Leave in a preheated 175 degree F oven for 25 minutes. Or boil the jars and lids in a large saucepan, covered with water, for 15 minutes. Use tongs when handling hot sterilized jars, to move them from either boiling water or the oven. Be sure tongs are sterilized too, by dipping the ends in boiling water for a few minutes. As a rule, hot preserves go into hot jars and cold preserves go into cold jars. All items used in the process of making jams, jellies and preserves must be clean. This includes any towels used, and especially your hands. This letter is going to seem very strange to you because it’s coming from your future and it’s written by you. I will explain…One day a very old man I have never seen before in my entire life walked up to me and presented to me a very strange little box. This old man who seemed older than time itself said that this box had the power to send it’s contents back in time to any location that you picked but it could only be used once per person, and to be very careful what I chose to put inside. I did’nt know what to say to him…this was all so very strange and unbelievable. I asked him why did he choose to give me this box, there were so many people in the world he could give it to, why pick me? He told me that he recieved the box yesterday, and inside the box was a letter that explained the box and that he was to take it to me (you). The letter said where I would be at this exact time on this day. Well I have thought a long time about how I would use this box, and I have decided to write a letter to you, my younger self, and tell you what you I feel you need to know and why. You are a very talented and creative person with a wonderful heart who would rather hurt yourself than be cruel to someone else. 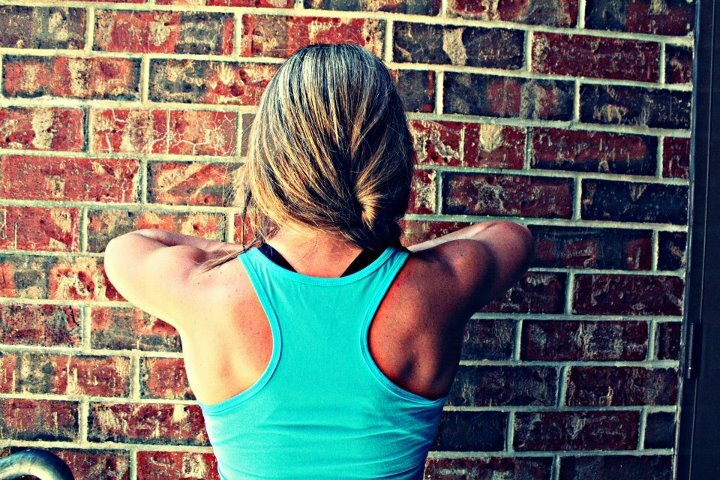 You are also stronger than you will ever realize. You are going to go through a lot of experiences in your life that would crumble most people, but you have a strength that is amazing and you will go on. A lot of people that are supposed to love you and protect you will hurt you very deeply but you will be able to forgive them because that is the wonderful heart you have I mentioned earlier. You have a wonderful imagination…use it to your greatest benefit and never let anyone tell you that you cannot do anything. The things that you are going to go through in your life don’t have to hold you back, they can make you better and stronger and build your character. You can use your experiences to your advantage as well, I suggest that you do, because maybe that is why you had them to begin with. They say God only allows us to go through what He knows we can handle…somtimes I question that though, how could God allow all that you are going to go through to happen, I don’t know, obviously He is putting you through these fires to make you who you are going to be, maybe He is allowing it because at some point in your life your are going to need to be strong for others, maybe you are going to go through some things that we have not experienced yet that would completely destroy someone else, or maybe He is just fueling our writing who knows. You stay who you are, don’t change for someone else, and don’t let other people determine you path, don’t feel bad if other people don’t approve or like what you choose to do with your life, because after all, it is your life, and you have to live in it, and you need to be happy. Forgive yourself for the choices you will inevitably make that don’t work out, and if the choices you do make don’t work out the way other people want them to then remember that is their problem not yours. I will advise you though to think very hard about getting married at a very young age, it’s not going to work out. You will have three children, one will die because of war, one will be born with special challenges and will overcome them because you made her that way, one will be kept from you for a portion of her life, not because of somthing you did wrong, but because of a choice you will make to love her more than destroy her. In the Bible King Soloman was faced with two woman who claimed to be a infants mother, they both wanted the baby, King Soloman said to cut the infant in half and give them each a part of the baby, the real mother spoke up and said no, let her have the child. In closing I just want you to know how wonderful you really are, because you are, you have a great heart and a great capacity to love other people who don’t really care about you, your kind, and generous, and who cares if others don’t always see it, because you and I know and God knows and that is really all that matters. Take care of yourself very well because you will have great illness in your life that will cause even more challenges for you to get through…but you will get through them I promise. P.S. Also think about how you will use that little box. Maybe give it to the little old man in the black coat….I think he is the keeper of the box, you will see him one day and he will tell you he is hungry, you will invite him in and feed him because that is the way you are, and he will thank you and say God will bless you greatly. Just how I don’t know. I have been wondering what kind of post I could start off with for the new year, and I thought this would be a great start. My ten favorite diy/crafts I found this year on the internet. The internet is a wonderful tool, I can not imagine life without now. I don’t know about you but I spend a lot of time looking for great ideas…somtimes more time than I do actually making them. I can’t help myself I just love doing it. So here is ten of what I put in my favorites this year. Hope you enjoy them as much as I have. 1. Geninne’s Art Blog: Uppercase! 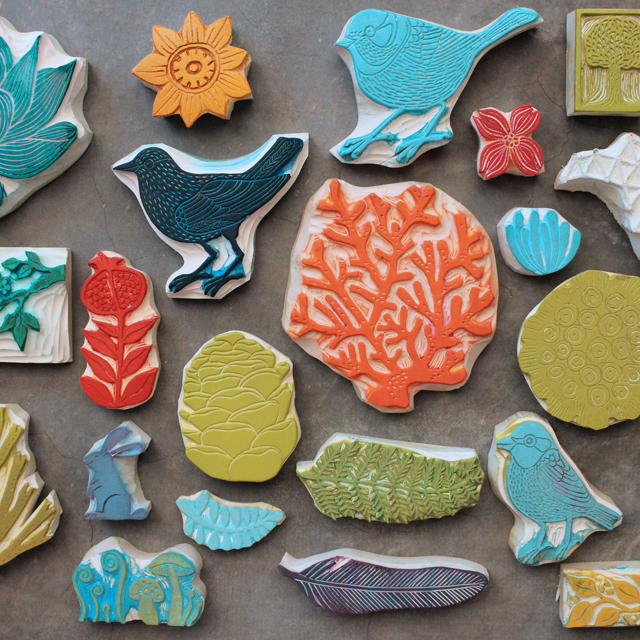 I love this Blog…If you love stamping..this is a must read. She has put together a great tutorial on how to make your own stamps as the above pic shows. Cheers for you Geninne and thankyou so much for sharing this with the world. 2. Rebecca’s Soap Deli News If you love to make soap this is a valuable site I love her blog. 3. The Mother Huddle I found the prettiest rose tutorial here among many other great tutorials ..great blog. 4. Two Girls Being Crafty Really cute idea for a scrap paper tree with real branches…love it..very cute blog. 5. 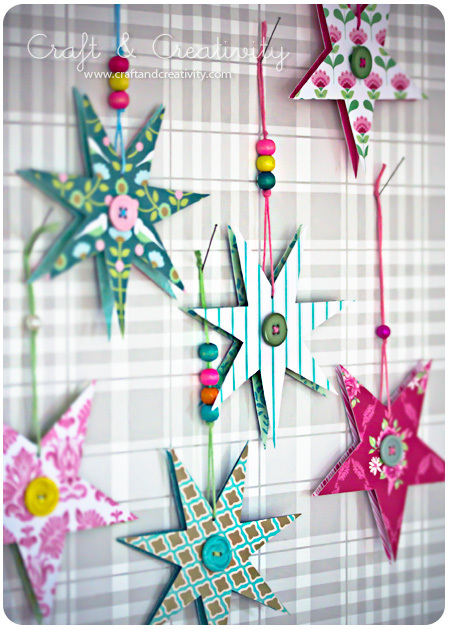 Craft And Creativity I love how this blog is writen in english as well as her language..its a beautiful blog with lots of inspiration and the paper stars are adorable.. great as ornaments. Her picture below. 6. White Life I found this blog different and very inspiring and the post about recycling old CDs is really cool and creative. I am definately saving my old ones now. 7. foodgawker I absolutely love this site..I find the best food recipes there. 8. craftgawker I love this one too….great ideas etc. 9. dwellinggawker And this one ….fantastic inspiration. 10. Pinterest And of course my most favorite of all …where I spend most of my time now, Pinterest. I can’t imagine life without Pinterest now. If you want to check out my boards on Pinterest please feel free, and make sure to follow me so I can follow you as well. I am so sorry…It’s been awhile since my last post, for reasons due to health. But I am back and ready to share what I have been doing lately…So look for posts to come. 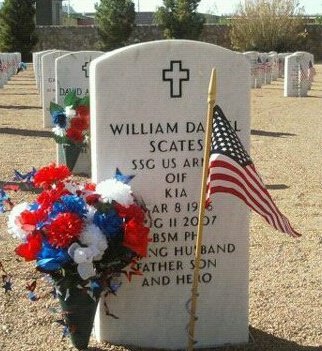 This is a picture of my son, Danny, William Daniel Scates. I named him after Daniel in the Bible, Daniel was a brave and corageous man, and so was my son. Danny was killed on his third tour of duty in Iraq , he was a Sargent, and he told me before he went back that he did not think he would make it back. He was a dedicated young man and believed it was his duty to go back and be with his men. He had a beautiful wife and two beautiful young daughters. We all miss him very much. He was truely an American Hero. Some time ago I was fortunate enough to come into contact with a woman named Karla Biggs. I don’t even remember how we came into contact with each other, it does’nt really matter I suppose. Anyway the point is, she is a wonderful lady and is affiliated with Heartmade Blessings, an organization consisting of a group of women all over the world who make Comfort Afghans as well as other things to comfort people who are grieving. Its a wonderful group full of wonderful ladies. This morning when I went to the post office to pick up my mail I was so surprised and touched by the package I found waiting for me. Inside was one of the Comfortghans they make. 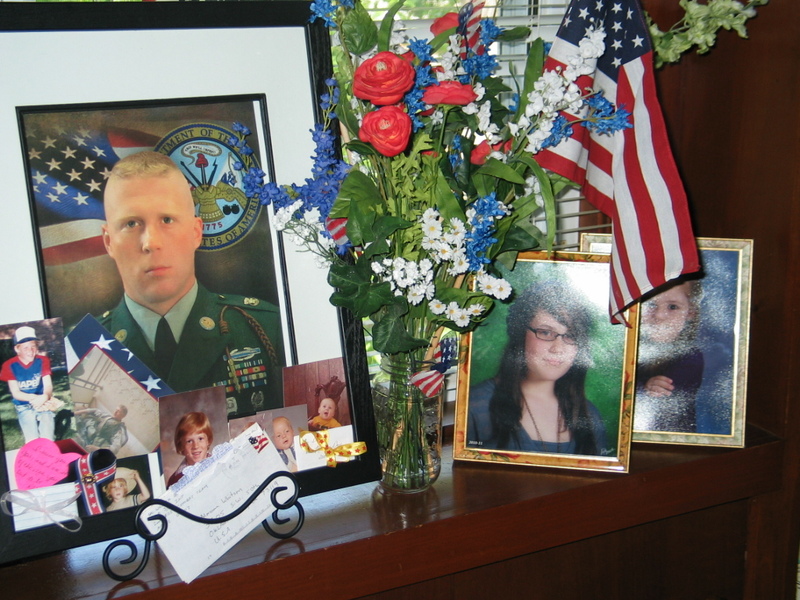 I lost my son, Danny to the war in Iraq on his third tour of duty over there, he was in the Army. This Afghan so touched me and truely is a comfort to know people in this world care that much. Thank You again ladies of Heartmade Blessings.